Written for the Teitho “Creatures” contest where it was placed third. “Have you heard the news?” Faramir asked as he entered Aragorn’s study. “Should I be alarmed or pleased by it, as you appear to be both?” the King asked. It was a fine afternoon so King and Steward decided to walk down to the bakery in the fourth circle rather than ride there. Their guards trailed behind them, trying to appear as inconspicuous as possible. 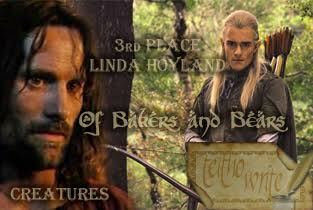 “It is a long time since I have tasted Beorning honey cakes,” said Aragorn. Faramir shook his head. “They must indeed appear as other men, then. I wonder-“ He broke off looking slightly uncomfortable. A small crowd was gathered around a small stall from whence emanated the delicious aroma of freshly baked cakes. Two burly, bearded men were serving their eager customers. “Don’t you want one for yourself, mistress?” asked the slightly taller Beorning. Faramir observed that he looked much as other hard-working bakers; a florid-faced man in his prime, with wide shoulders, strong, well-muscled arms, and a grin for his customers. Neither baker looked likely to change into bears. Aragorn and Faramir watched as Ragnar surreptitiously added another cake and smiling, gave the parcel to the old lady with a cheery, “See you again soon, mistress, I hope.” Both brothers smiled and waved as the old dame hobbled away. When Aragorn and Faramir reached the front of the queue, they ordered a dozen cakes each. “Have you children, good sirs?” asked Ragnar. “I will give your little boy a cake if you ever bring him this way,” said Ragnar. Aragorn and Faramir were unable to resist the aroma of the freshly baked cakes. They settled themselves on a nearby bench where they continued to watch the Beorning brothers serving their customers. Aragorn took a bite of his own cake. “I wonder if it is something they feed to their bees that makes the cakes so good?” he mused. Olaf disappeared into a room at the back of the stall and a few moments later, a comely young woman emerged from behind the counter, carrying a tray of freshly baked cakes, which she placed at the front of the stall. Just then, a group of rowdy young men emerged from a tavern opposite to the bakery. They ambled over to the cake stall and pushed past a group of middle -aged ladies and children waiting to be served. “How might I be of service, sirs?” said the young woman. Despite her polite words, she was frowning as she backed towards the stall. “I can think of a good many ways,” said one of the men, causing the woman to blush. “Give us a kiss, fair maid,” said another. “Don’t be like that,” said one of the men. “We can give you sweeter pleasures than honey cakes,” said another. He seized one of her long braids and pulled roughly pulled her towards him roughly. The woman screamed and kicked her assailant. “Unhand my wife this instant!” cried Ragnar. “A lusty wench like this deserves better than a great oaf like you,” said a third man. Aragorn and Faramir reached for their swords, but before they could intervene, the man grabbed the woman and pulled her towards him. At the same instant, Ragnar gave a great roar and changed into a great black bear before their eyes, his garments tearing apart and falling from his body as the transformation took place. The men fled. The bear gave a great leap over the counter and pursued them. The ladies screamed and jumped out of the way, pulling their children with them. The louts knocked over a barrow of potatoes in front of a greengrocer’s stall, scattering them over the road. Aragorn and Faramir raced after the bear, but stumbled on the potatoes, which slowed them down. Everywhere, folk screamed, panicked, and dived into shops and behind market stalls. One old lady clutched her chest and fell to the ground in a swoon. Other, calmer stallholders grabbed their merchandise and placed it out of harm’s way. Aragorn hesitated, wondering whether to go to the old woman’s aid, and then decided that if the bear were not stopped there could be many more casualties. He shouted for help and guards came running from all directions armed with swords, spears and bows and arrows. He kept running in the direction of the bear. Though it was out of sight, the screams and commotion in the street ahead made its presence all too clear. The bear continued its rampage through the City streets. Aragorn spotted the group of louts trying to creep out from an alleyway and called to a nearby guard to arrest them. He kept on running; Faramir was close at his heels. Suddenly, he spotted the bear a little way ahead. The gate to the third circle had been closed and the bear found itself trapped. One of the guards drew his bow and nocked an arrow. The commotion drowned out his voice though. The guard loosed the arrow. The bear fell to the ground. The crowd gasped. Aragorn ran forward. There was no sign of the bear. Instead, a hirsute, naked man lay on the ground, writhing in agony, an arrow protruding from his back. The guards ran forward too, their weapons in their hands. They regarded the fallen man in bewilderment. Several people in the crowd cried out and a woman swooned. Two guards brought a stretcher and supervised by the King, they lifted Ragnar on to it. This was no easy task as the Beorning was no lightweight who writhed and struggled in their grasp. Ragnar looked at Aragorn, fear in his eyes. Several hours later, Aragorn sat at Ragnar’s bedside in a small room in the Houses of Healing. Shortly after their arrival there, the King had assisted one of the healers in removing the arrow. The Beorning had been fortunate as the arrow had missed any vital organ and merely shattered the two ribs it had wedged between. An unpleasant, painful injury, but one from which he believed the skin changer should make a full recovery in time. Ragnar stirred and opened his eyes. “Where am I?” he croaked. Ragnar gave a sign and nodded. “What you do in the privacy of your home; or alone in the countryside is up to you as long as you do not harm anyone,” Aragorn added. “I suppose we will need to give up our bakery and return home after what happened today,” said Ragnar sadly. “Can we have a really big bag of cakes?” asked Eldarion. “I cannot see why not?” said Arwen. “They are the best cakes ever!” said Eldarion. “Better than cook’s?” asked Elestelle. “Better even than our cook’s,” Eldarion replied. “You must not tell the cook you think that,” said Arwen. “Are they really so good, Naneth?” asked Elestelle. “You need to taste them and see,” said Éowyn. “Want cake!” demanded little Elboron who was perched on his father’s shoulders. “Why do we have to wait so long?” grumbled Elbeth. “It is almost our turn,” said Aragorn. A woman turned round balancing her shopping bag and a large bag of cakes. She almost collided with Aragorn. “Pardon, my lord!” she cried. Ivorwen curtsied. “I never expected to see you and the Queen and the Steward and his lady queuing for cakes!” she exclaimed. “I always imagined you would have your servants come and buy them for you,” said Ivorwen. “I believe honey cakes taste better after a walk and a wait,” said Aragorn. “Good day, Mistress, Ivorwen,” said Aragorn. “I will see you soon at the Houses.” He turned towards the stall to find Ragnar staring at him in astonishment. “The King at my stall and you were so kind to me!” Ragnar bowed low, as did his wife and brother who had emerged from the room at the back. “How are you, Ragnar?” asked Aragorn. “Much improved, my lord. He shook his shaggy head. “The King at my stall?” he repeated.